There are many breeders who believe that excessive in breeding is detrimental to advancement of the breed. Out crosses and diversity are keys to advancing the breed. In the other corner many breeders believe that inbreeding is needed to keep certain lines vigorous and strong. As with so many examples of each breeding theory, there are successes and failures to point to. In 1976 a lovely chestnut filly was born that would in essence become a source of debate on both sides of the argument. Her name was Fall Aspen. Fall Aspen was bred by Joseph Roebling in Kentucky. She came from a strong family that Roebling had been developing for a few generations. The fourth dam is Sunfeathers by Sun Briar which Roebling bred to Case Ace to get Fall Aspen’s third dam Carillon. Carillon produced champion two year old Blue Peter by War Admiral, and that one’s full sister Portage. Portage was bred to champion Swaps to get Fall Aspen’s dam Change Water. Change Water was inbred to War Admiral 4×2. The sire of Fall Aspen was 1967 Santa Anita Handicap winner Pretense. Pretense was also victorious in the Gulfstream Handicap, San Antonio Handicap and six other graded stakes races on both dirt and grass, leading him to be named as the champion handicap horse for the year. His pedigree was an interesting one for American breeding as Pretense was by Endeavour II out of Imitation by Hyperion. Endevour II was a representative of the Phalaris sire line, although he came from the lesser known Manna branch. He also carried two crosses of the seminal broodmare Selene through Hunter’s Moon and Hyperion. When Pretense was bred to Change Water, he was already known as the sire of the very fast but unlucky Sham. Sham was unlucky due to the fact that he had been born in 1970 and thus came up against the immortal Secretariat for the American classic races of his generation. Pretense was known as a consistent sire, getting twenty-two stakes winners from five hundred and one foals. His daughter Fall Aspen would become his key to future pedigree renown. With the mating of Pretense to Change Water, the resulting filly Fall Aspen had many duplicated names within her five generation pedigree. Hyperion 3×4, Selene 5x4x5, Teddy 5×5, Son-In-Law 5×5 and War Admiral 5×3. Oddly for a foal of 1976, there was only one distant cross of Phalaris (sixth generation), which considering the saturation of Phalaris blood by this point in time seemed somewhat rare. Fall Aspen raced for her breeder Roebling and was trained by Al Barrera. She won some very important races. In her juvenile season Fall Aspen won the grade one Matron Stakes and the grade three Astarita Stakes, and took the Prioress Stakes as a three year old. In total Fall Aspen won eight of twenty races with three second places in the mix. During her four year old season, Roebling passed away and his entire bloodstock was sold in dispersal later that year. Fall Aspen was purchase by Brownell Combs II at the Saratoga venue for $600,000 and placed in the Spendthrift broodmare band. Combs sold a half interest to Francis Kernan. The first foal Fall Aspen produced came in 1982 and would be a good one. Northern Aspen was a bay filly by the incomparable Northern Dancer and went on to win the grade one Gamely Handicap, the group two Prix d’Astarte and the restricted Thoughtful Stakes, in a racing career that encompassed both French and American race tracks. She also had second place finishes in the grade one Santa Barbara and Santa Ana Handicaps, as well as the group three Prix Quincey. Northern Aspen then produced stakes winner Cypriata and is the third dam to Japanese 1000 Guineas winner Reginetta. Second foal from our subject mare was a chestnut daughter by Exclusive Native named Elle Seule. This daughter also went to France to begin her racing and captured the group two Prix d’Astarte, the year after her half sister had won the same trophy, and the listed Prix des Tuileries. Retired for broodmare duties, Elle Suele became the first of several daughters of Fall Aspen to carry on the line to great heights. Among her offspring are champion three year old filly Mehthaaf (Irish 1000 Guineas, Celebration Mile) by Nureyev, champion English sprinter Elnadim (July Cup) by Danzig, Khulood (Nell Gwynn Stakes) by Storm Cat, and multi stakes winner Ashraakat (Sceptre Stakes) by Danzig. Elle Seule’s daughter Only Seule by Lyphard has done well to continue the tail female line. Occupandiste by Kaldoun is out of the latter. Trained by Criquette Head, Occupandiste won the group one Prix Maurice de Gheest and Prix de la Foret. She added the group three Prix des Reservoirs and Prix de la Porte Maillot before retiring to a successful life as a broodmare. Her son Mondialiste by Galileo has been a recent top miler in world racing circles. Mondialiste has won the grade one Woodbine Mile and grade three Strensall Stakes. He was also second to the exceptional Tepin in the Breeder’s Cup Mile and this past year won the grade one Arlington Million. Occupandiste is also the dam of group two winner Impressionnante (Prix de Sandringham) by Danehill and group three winner Only Answer (Prix du Petit Couvert, Prix de Saint-Georges) by Green Desert. Impressionnante is the dam of 2013 Prix du Jockey Club winner Intello. Returning to Fall Aspen we see her third foal named Native Aspen by Raise A Native was the final breeding orchestrated by the Combs/Kernan team. Native Aspen was a modest stakes placed winner of four races. Fall Aspen was sold for $900,000 in foal to International Thoroughbred Breeders, who then sent the mare to two time Prix de l’Arc de Triomphe winner Alleged. This mating produced a second consecutive colt in the form of Goodwood Cup winner Mazzacano. Fifth foal from Fall Aspen would become one of her most important foals to future breeding. Sent to Shareef Dancer, Fall Aspen gave the world a dark bay filly that went by the name of Colorado Dancer (G2 Prix de Pomone, G3 Prix Minerve). Bought by Sheikh Mohammed as a yearling, Colorado Dancer would then produce the wonderful Dubai Millennium from a cover by Seeking The Gold. Dubai Millennium went on to become a two time high weight in England and UAE Horse of the Year. Standing only one season at stud, Dubai Millennium sired multiple group one stakes winner Dubawi, currently one of the top five sires in the world today. Dubai Millennium unfortunately died from grass sickness during his first year at stud. Dubawi is the star stallion in the vast Darley Stud empire. His 2017 stud fee is a cool two hundred and fifty thousand Euros, and he has earned the lofty price by siring such exceptional talent as Arabian Queen, Night of Thunder, Makfi, Postponed, Erupt, Poet’s Voice and Monterosso. He has sired twenty-six grade/group one stakes winner at time of writing. The remarkable luck of the draw for the family to get such an exceptional sire by Dubai Millennium from only fifty-six foals from one crop is surely poignant. Dubai Millennium was Sheikh Mohammed’s favourite horse, and this man has bred many top class horses over the years. The tragic loss has been tempered somewhat with the success of Dubawi. Fall Aspen continued her remarkable production with the filly Dance of Leaves by Sadler’s Wells in 1987. Dance of Leaves went unraced due to an injury, but would later became the dam of group one winner Medaaly (Racing Post Trophy) by Highest Honor and multi stakes winner Charnwood Forest by Warning. The year after Dance of Leaves came Sheroog, a full sister to Colorado Dancer. Sheroog won one of eight races, no black type, and later became the dam of Kabool (G2 Prix Guillaume, G3 Prix Daphnis) by Groom Dancer, Sharaf Kabeer (Bahrain Gold Cup) by Machiavellian and Gorband by Woodman. Gorband in turn is the dam of South African group one winner Europa Point (President’s Champions Challenge, Empress Club Stakes) by Rock of Gibraltar and Harbour Watch (G2 Richmond Stakes) by Acclimation. Sent to Danzig, Fall Aspen produced the bark bay colt Hamas in 1989. Hamas won the group one July Cup and the group three Duke of York Stakes for Shiekh Hamdan. Hamas became a stallion at Derrinstown stud and was the first shuttle sire for the Sheikh’s breeding centre at Glenlogan Park Stud in Australia. By now Fall Aspen was owned by David Jamison, who had purchased the mare at the 1987 Keeneland November mixed sale for $1,100,000 while she was in foal with Sheroog. Jamison bred Fall Aspen back to Sadler’s Wells in 1989 and the following spring she produced Grand Prix de Paris winner Fort Wood. Bought by Sheikh Mohammed, Fort Wood raced in his Godolphin colours and then was sold for stud duty to South African breeder Bridget Oppenheimer to stand at Mauritzfontein Stud where he became a resounding success. Fort Wood sired the wonderful South African Horse of the Year recipient Horse Chestnut, winner of the South African Triple Crown. Horse Chestnut is widely considered as one of the finest horses ever bred in the country. He stood initially at Claiborne Farm in Kentucky and is now plying his trade in his native land at Drakenstein Stud. Fort Wood is also the sire of both Celtic Grove and Dynasty, each being S.A. Horse of the Year award winners. The latter has been a very good sire in South Africa and has won an Equus Outstanding Stallion title and has also sired a pair S.A. Horse of the Year award winners in Legislate and Irish Flame. Fort Wood has been a powerful force in South African breeding. He led the country sire list in 1998/99 and has twice led the broodmare sire tables. Fort Wood has sired sons to carry on the line in top order and his daughters have become highly sought after broodmares, having produced the likes of Pluck (Breeder’s Cup Juvenile Turf), Capetown Noir, Bouquet-Garni and Cherry On The Top. He passed away in 2015 at the age of twenty-five. The year of 1991 would be the first year in which Fall Aspen did not produce a foal since she entered the broodmare ranks. She resumed her production the following year with perhaps her most accomplished offspring on the track in the form of her chestnut son Timber Country by Woodman. Timber Country became the Eclipse Award Champion Two Year Old in 1994 due to his winning the Breeder’s Cup Juvenile and the Champagne Stakes. He won four of seven races as a juvenile. Coming back for a run at the American classics, Timber Country placed in both the San Rafael and San Felipe Stakes before he finished third to Thunder Gulch and Tejano Run in the Kentucky Derby. Two weeks later Timber Country won the Preakness Stakes to add a classic win to his résumé. He injured a tendon not long after missing the Belmont Stakes due to a virus and was subsequently retired from racing. Sold for $12,000,000 dollars to stand stud in Japan, Timber Country had a solid record as a sire that would see him stand in five different stud farms. Two in Japan, Shadai and Lex Studs, and two in Australia, Arrowfield and Eliza Park Studs, where he was shuttled for dual hemisphere duty, and one year as a lease at Emirates Stud in Dubai. Eight time group one winner Admire Don is perhaps the best of Timber Country’s progeny. He also sired the good filly Balletto (Frizette Stakes) and gelding Eremein (Australian Derby, BMW Stakes) among his eighteen stakes winners. He is also the dam sire of Mukhadram (Eclipse Stakes), Sweet Idea (Galaxy Stakes) and Copano Rickey (February Stakes twice, JBC Classic twice, Kashiwa Kinen twice). Timber Country died of heart failure in 2014 at Lex Stud at the age of twenty-four. Stakes winner Prince of Thieves by Hansel became the eleventh foal of Fall Aspen in 1993. Prince of Thieves won the Santa Catalina Stakes and placed third in the Kentucky Derby before he sadly broke down and had to be humanely euthanized. When Prince of Thieves was a yearling, his dam was sold yet again at the Keeneland November mixed sale. In foal for a second time to Danzig, Fall Aspen was purchased for $2,400,000 by John Magnier of Coolmore fame. The following spring, nineteen year old Fall Aspen produced a dark bay colt that would eventually go by the name of Bianconi. Bianconi would become the champion three year old sprinter in Ireland after he won the group two Diadem Stakes. Standing initially at Ashford Stud in Kentucky, Bianconi was shuttled to Coolmore’s Australian stud farm Swettenham and stayed here until 2014 when he relocated to Ridgeview Stud. He had moderate success as a sire getting seven stakes winners but many non stakes winners for local Victoria breeders. The best of his get was undoubtedly Nicconi (Galaxy Stakes, Lightning Stakes) and Fillydelphia (Rough Habit Stakes, Reconition Handicap). Fall Aspen produced two more foals, a filly by Woodman named Aspen Leaves who won one of three races and a colt by Thunder Gulch named Martinelli who placed third in his only track appearance. 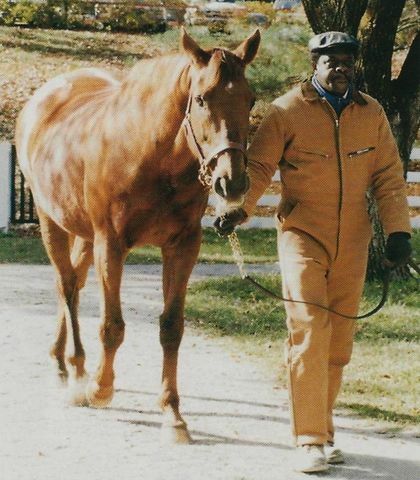 The great mare died of foaling complications on February 3, 1998 at Ashford Stud. She produced fourteen foals, twelve of which were winners. Nine of her offspring became stakes winners and four of those won at the grade/group one level. Where Fall Aspen is highly revered, is as the matriarch of a family that has had enormous success around the world, and not just in a local or regional area. She was bred predominantly to stallions that were almost total out crosses, within the first five generations, of her own pedigree. Although she herself was inbred to four different names in her ancestry, her suitors were of completely different lineage. Timber Country and Aspen Leaves, both by Woodman, had the most duplicated names within the pedigree of Fall Aspen progeny. When we look back on the broodmare career and legacy of Fall Aspen we have to marvel at the prolonged influence she and her children have exerted on the breed. Dubawi, Fort Wood, Timber Country, Horse Chestnut, Dynasty, and likely sons by these stallions will continue to add further laurels to a legacy of this great broodmare. The daughters of Fall Aspen have also been solid contributors to their mother’s standing as a foundation matriarch. This legacy still has many chapters to be written at this time with the likes of Mondialiste, Intello, Capetown Noir, Mukhadram and more entering stud duty in the past few years. Given the success of stallions descending from Fall Aspen, these new young sires should be in high demand. Fall Aspen was a magical matriarch in many ways. A good testament to her ability and popularity among breeders would be that she was sold four times as a broodmare and obtained higher prices each time. Usually older mares are known to have their production wane after a few years, but not Fall Aspen. She produced her ninth stakes winner when she was nineteen and her most prominent stakes winner was foaled when she was sixteen. Remarkable. One of the great broodmares in my lifetime, Fall Aspen is perhaps one of those horses that are under the radar of casual racing fans, but widely known by those who follow breeding in depth. Ok i am one of those who did not know how much this mare has contributed to the breed. Wow what a great mare. Thanks for a great read about this great mare. Fall Aspen is a giant in the breed. Outstanding mare. Thanks for the lesson. Enjoyed the read very much.